Integrating Python with Leading Computer Forensic Platforms takes a definitive look at how and why the integration of Python advances the field of digital forensics. In addition, the book includes practical, never seen Python examples that can be immediately put to use. Noted author Chet Hosmer demonstrates how to extend four key Forensic Platforms using Python, including EnCase by Guidance Software, MPE+ by AccessData, The Open Source Autopsy/SleuthKit by Brian Carrier and WetStone Technologies, and Live Acquisition and Triage Tool US-LATT. This book is for practitioners, forensic investigators, educators, students, private investigators, or anyone advancing digital forensics for investigating cybercrime. Additionally, the open source availability of the examples allows for sharing and growth within the industry. 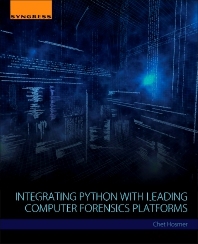 This book is the first to provide details on how to directly integrate Python into key forensic platforms. What Is the Python Value Proposition for Forensics? What Are the Possible Integration Points and Methods? What Forensic Platforms Are Covered? Chet Hosmer is the Founder of Python Forensics, Inc. a non-profit organization focused on the collaborative development of open-source investigative technologies using the Python programming language. Chet serves as a visiting professor at Utica College in the Cybersecurity Graduate program where his research and teaching focus on advanced steganography/data hiding methods and related defenses. He is also an Adjunct Faculty member at Champlain College in the Masters of Science in Digital Forensic Science Program where he is researching and working with graduate students to advance the application Python to solve hard problems facing digital investigators. Chet makes numerous appearances each year to discuss emerging cyber threats including National Public Radio's Kojo Nnamdi show, ABC's Primetime Thursday, NHK Japan and ABC News Australia. He is also a frequent contributor to technical and news stories relating to cyber security and forensics and has been interviewed and quoted by IEEE, The New York Times, The Washington Post, Government Computer News, Salon.com, DFI News and Wired Magazine. He is the author of three recent Elsevier/Syngress Books: Python Passive Network Mapping: ISBN-13: 978-0128027219, Python Forensics: ISBN-13: 978-0124186767 and Data Hiding which is co/authored with Mike Raggo: ISBN-13: 978-1597497435. Chet delivers keynote and plenary talks on various cyber security related topics around the world each year.